NCN Lon Cambria Themed TrailLôn Cambria is a 113-mile cycle route in the National Cycle Network which runs from Aberystwyth on the Mid Wales coast, through the Cambrian Mountains and the Mid Wales Marches to Shrewsbury. 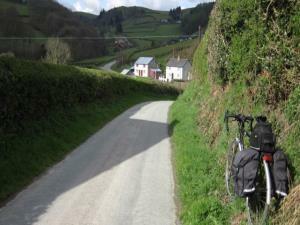 Starting in Aberystwyth this spectacular route crosses the heart of Mid Wales through the Cambrian Mountains and alongside the beautiful Elan Valley reservoirs to Rhayader. With red kites soaring above, the route follows quiet lanes linking the picturesque market towns of Llanidloes, Newtown and Welshpool. A final climb on the Roman Road over Long Mountain offers panoramic views before descending into Shrewsbury with its rail connections for the journey home. A great cycle short break. Lôn Cambria is a 113-mile cycle route in the National Cycle Network which runs from Aberystwyth on the Mid Wales coast, through the Cambrian Mountains and the Mid Wales Marches to Shrewsbury. Access the route using the Cambrian Rail line.